Nolden Gentry stands next to a sign welcoming people to the dental clinic named in his honor at Scavo High School. Courtesy: Des Moines Public Schools. PHC will operate the medical clinic which will be open 5 days per week, during the school year, from 10 – 2 to serve students and faculty. The Des Moines School District has plans to provide transportation to the clinic from other area schools for students who need access to dental and medical care. In addition to the medical and nursing staff, the clinic will also be staffed with a benefit and enrollment specialist who will assist students and their families obtain access to insurance coverage. 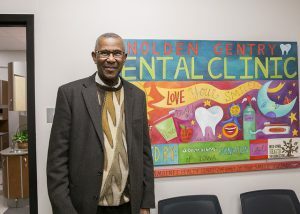 You can read more about the new dental and medical clinic at this link. You can also hear more about it on Iowa Public Radio.